For his dissertation, Adis deepened and widened this research topic by studying the origins, founding, electoral triumph and subsequent political machinations of the Serb Democratic Party, Jan 1990 to April 1992 when the Bosnia war erupted with intensity. The argument in that article about the power of visceral understandings and affective experience of the nation in recruiting people to ethnonationalist movements, ethno-parties and ethnicized violence. Beyond exploring the power of affective thinking, Adis provides the best and most deeply researched account of Bosnia’s road to the ‘gates of hell’ I have read. It is a story full of contingencies and fluidity, and he relates it with extreme attention to the ‘mixed emotions’ of the participants (as well as with exemplary scholarly evenhandedness). Karadžić famously interpreted the idea of placing state borders between Bosnia and Serbia as “severing the living flesh of the Serb nation.” What is striking about the 1990-91 period is how permeated it was by fears and fantasies of extreme violence. 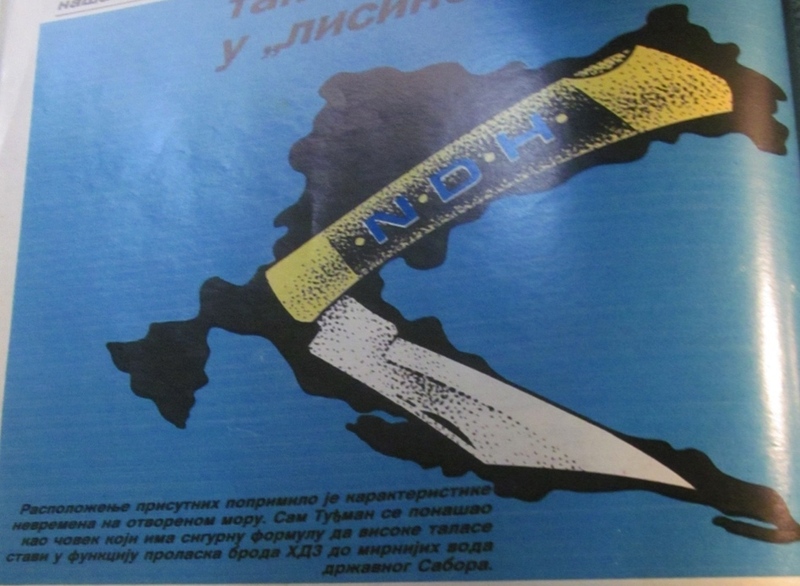 Fear of a return of the Ustasa in Croatia was a primal theme that played on the consciousness of many (the map above is the illustration of an article in the Serbian weekly NIN on the coming to power of the HDZ in April 1990 after democratic elections in Croatia). Mass graves sites were dug up (‘pits’) and victims of the Partisans re-buried in services that created communities of affect. By way of establishing perspective on the SDS and BiH/Yugoslav context, Adis develops an asymmetrical comparison with the rise of the Georgian national movement at the same time, analyzing Gamsakhurdia and ‘Round Table – Free Georgia’ within the terms of his overall three part analysis of political opportunity structures, dissemination modalities, and discursive framings. It is always gratifying when a Ph D student, through hard work and serious scholarly application, reaches his or her potential in a work. Adis Maksic has done so in this work and hopefully we will all see this work in book form within the next two years. Pictured with Adis in black suit and tie are external observer Dr Sarah Wagner (whose book on Srebrenica has just been published) and his Ph D committee Dr Giselle Datz, Dr Toal and Dr Joel Peters. Not pictured yet an integral and inspiring part of his committee is Dr Robert Donia, whose new biography of Radovan Karadžić has just been published, also by Cambridge University Press. Its cover photo of Karadžić before a map underscores the intimate connections between cartography, space and genocide. This entry was posted in Affect, Bosnia, Bosnian war, Cartography, Current affairs, Democracy, ethnic cleansing, genocide, Georgia, nationalism, neuropolitics, South Ossetia, World political map. Bookmark the permalink.